As leaves tumble to reveal bare branches, nights become longer and frosts fiercer, it can be tempting to believe that pests are no longer on the prowl. But late autumn and early winter is a crucial time of year for preventative pest control on fruit trees. There are five simple techniques that I have found to be effective at keeping fruit tree pests at bay. Conveniently, they can be carried out once the frantic pace of the main growing season has passed, meaning you can give your full attention to this important task. Not all moths fly, which is why glue bands and tree barrier glues are very effective measures against destructive caterpillars. The caterpillars of winter moth are often the culprit behind holey leaves on plums, apples and other trees in spring. They will also damage developing fruits, so that they either drop while still immature, or grow misshapen, scarred and sometimes holed. Adult winter moths lurk in the soil until late autumn, when they emerge to mate. Once mated, the wingless female clambers up a tree trunk and lays her eggs in the branches. She can be stopped in her tracks by a sticky barrier. Glue bands work well on trees with smooth bark like my plum tree in the photo at the top of the page. Trees with more fissured bark can be protected by slathering on tree barrier glue directly. Aphids are regular visitors to my apple trees every autumn, congregating on the leaves before they fall and laying their eggs in the branches. Aphids feed on new shoots of fruit trees and can cause leaves to become disorted. In severe cases, fruiting may be affected. Minor infestations, particularly on larger trees, are unlikely to cause major problems and can often be ignored. On younger trees, if aphids have been a problem in previous years, it may be necessary to take action. The first step is to use a jet of water to dislodge aphid eggs. If this isn’t successful, try an organic winter wash based on plant or fish oils. It will destroy aphid eggs and other overwintering pests. For it to be effective, a winter wash needs to be applied in early winter, after the leaves have dropped, and again in spring before the trees burst into growth. Choose a windless, dry day to apply winter wash, and wear gloves and goggles. Believe me, blowback is not pleasant! Dilute the concentrated winter wash with water in a spray bottle and give the bottle a shake to mix it well. 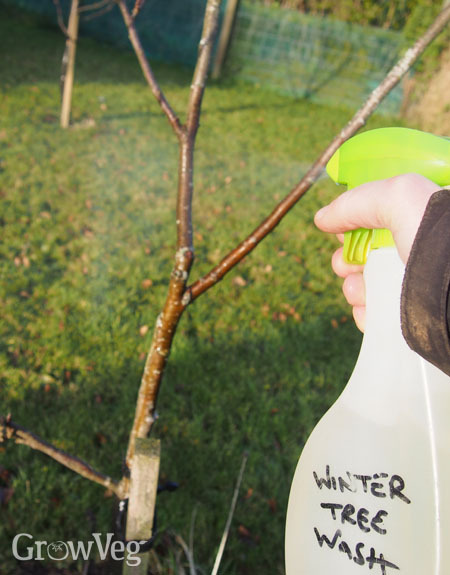 Spray it onto your trees, paying special attention to any nooks and crannies where branches join, and around the buds. I find that using a soft brush to gently scrub particularly badly infested areas helps. Spray any tree stakes too. Some pests will overwinter in leaf litter or in the soil around your fruit trees so they can be near to their food source when spring comes around. Good garden hygiene is the answer. Rake up all fallen leaves and compost them away from your trees to foil pests such as apple blossom weevil, which can destroy flowers and ruin your fruit crop. If your trees are surrounded by soil rather than grass, rake around them to expose overwintering pupae of bugs such as sawfly to frost and birds. Tree bark is often nibbled by hungry rabbits, voles and other rodents. If they manage to strip off the bark all the way around the trunk (known as ‘ring-barking’ or ‘girdling’), this prevents carbohydrates from photosynthesis being transported to the roots, and is usually fatal. Using a tree guard prevents stripping of the bark. Plastic tree guards are not, in my opinion, the best choice; I have found that they can harbour pests and they tend to keep the bark damp, which encourages disease. I prefer to make a protective tube of wire mesh, as it allows free flow of air, is less hospitable to insect pests and is impossible for rodents to gnaw through. Choose fine wire mesh if your trees are plagued by smaller rodents such as voles, and make sure there is a wide enough gap between the trunk and the mesh so that hungry muzzles can’t push through and reach the bark. Flex the mesh into a tube and secure it using cable ties or wire. Use a cane to keep the tree guard upright, and make sure the wire is pushed firmly into the soil with no gaps at ground level. You may be able to remove guards in summer if the rodent problem is limited to the winter months. The larvae of lacewings, ladybirds and hoverflies are voracious pest-munchers. Weather permitting, the period between autumn and spring is a good time to establish more nectar-rich perennial flowers to attract these and other pest predators. Try bugle (Ajuga reptans), asters, daisies or lavender for starters. Make sure to provide overwintering habitats so that predators are on hand to step in when pests begin to become a nuisance next year – piles of stones or twigs, hedges and hollow standing plant stems all make great habitats, or you can make a bug hotel. While birds often get a bad reputation for snacking on fruit, insectivorous birds are excellent pest controllers. Get their attention by providing habitat, winter food and water, and they will seek out bugs in your trees and in your soil. Insects are much less active during the colder months, but don’t forget to report any you do see to The Big Bug Hunt. "I'm very excited in Encourage Pest Predators. Not just protect the environment but also makes the garden becomes interesting."